Finally! A show that speaks to the hearts and minds of Conservatives and Libertarians. 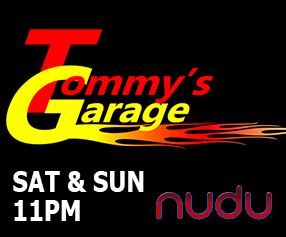 The New Dumont Television Network (commonly known as 'The NuDu') proudly presents "the loudest most politically incorrect television show on the planet", Tommy's Garage! This one hour show is locally recorded and produced fifty weeks every year out of the home and garage of Houston host, Tom Adkins. Each week Tom and his panel of guests, a group of professional area comics, look at politics, national, international, and down right too crazy to believe news they generate. This show is perfect for late night fringe, 11PM and later time slots. KRIV, a Houston FOX affiliate, aired Tommy's Garage at 1AM Saturday and regularly garnered a 1.6 in Nielsen ratings. The hour show format consists of seven segments. At this first offering all available commercial time will belong to the airing station. We are confident you will find value in this syndicated program to your station and audience. The show is available for air right now for the rest of 2018. Please contact Mark Kennedy with NuDu-TV to discuss availability in your market. OUTSTANDING!!! Attended filming recently. Very professional, fun group. Not mean. Just funny. The whole world needs to pay attention to what these people are saying. A little laughter goes a long way. Thanks, Judy! It was a blast having you at the show! Tommys garage is a best garage and people who are working in this garage are really best. They work hard like masters dissertation proposal students just to achieve their goals. I am really lucky to read this blog and understand it as a good blog. A person is here who recount to us about their short story of the life. He need to share his entire buy essay online story with us since he is new in this field. Furthermore, might be this is the recently fellow who need to influence their future in the realm of the author to seek after the best and might be you locate the most ideal way. They are here to help others in a good way. We know that we face problems and someone solves it easily. The Elie Hirschfeld also ready to help others especially those who face problems in education. mafia city Background and communication, matters not. Here, there are only brothers and loyalty. Good to get this post. Take seo training course In delhi in Digitalhikes, this is the best p[lace for a digital marketing course.